Imagery. Why Give? employs a powerful and gripping metaphor for giving - that God created us to be like rivers. DeVries points out that the Bible begins in Genesis and ends in Revelation with a picture of a river. "We are born again to be rivers," he explains, with life flowing in and out of us. "Living to get instead of living to give results in sin and death...salvation is not a possession to be ‘gotten,' but a transformed condition in which we begin eternal giving." This reality points to a warning in our daily living, where a "fear over possessions gained or lost is the essence of hell itself...the more independent we are [with money] the more we shut the door to the streams of eternal life flowing through us." What We Give. DeVries explains that our living and giving provides seven wonderful things to the world around us: the gift of Christ's presence, the power of Christ, the provisions of Christ, the perfection of Christ, the resurrection of Christ, the comfort of His eternal reign, and the comfort of Christ's return. How We Give. Why Give? reminds the reader that giving is with the head as well as the heart. Not only does giving engage the emotions of the giver, but it must also meet the actual need of the person to whom we give. Giving with the head is focused, accountable, productive, transparent and joyous. God's Approach. God gives His gifts through us, opening "the windows of heaven and [allowing] the rain of God's abundance to fall." If our gifts seem small in our eyes compared to the overwhelming challenge, DeVries says "we set up an opportunity to see God's multiplying work in meeting the need and resupplying our limited resources." If we are able to give large gifts, DeVries cautions that our gifts not "point to us, to our power and wealth" but instead to God's infinite generosity. Whether rich or poor or somewhere in between, "if God is to be honored by the gift, the gift must be significant to the giver." Results of Giving. Why Give? makes the case that giving unlocks God's infinite resources. If we give in order to get for ourselves, we succumb to the heretical "prosperity" doctrine. 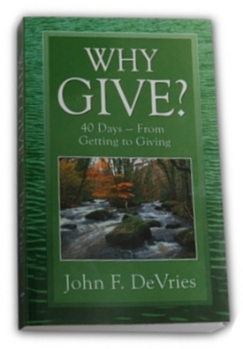 Instead, DeVries explains, we give in order to get in order to give more! The result of this kind of giving is joy - becoming more like God, experiencing sympathy for others, discovering God's infinite resources, feeling a renewed joy from within, following Christ's example, connecting with the grace of God that inspires more giving and joy, and motivating others to give. Things to be aware of: The author, John DeVries, is also the founder of Mission India, a Christian organization dedicated to transforming India for Christ in partnership with Indian believers through children's Bible clubs, adult literacy classes, and church planter training. While the book does display the Mission India logo on the back cover and contains a few references to mission work in India, Why Give? stays clear of sounding anything remotely like a commercial for the organization, and instead stands on its own as a fresh, practical, and inspirational look at biblical stewardship.